Windows Home Server provides an easy to use remote access mechanism that enables a user to upload and download files to/from ones Windows Home Server when they are not on their local network. One big problem... it's web browser based and one of the key paradigms users are used to does not exist... file and folder drag and dropping. 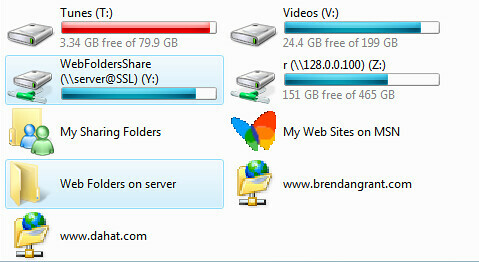 My new add-in, WebFolders4WHS gives users a new browser based way to access their files, as well as letting them do it through the Windows Explorer shell and any other WebDav client that supports HTTPS. A small settings tab is also added which provides basic information on the state of the add-in and allow you to set it up or remove it's configuration. 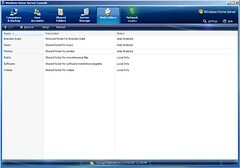 When you move to the client side, a user can simply create a folder in My Computer (under Vista) or My Network Places (under XP), and in Vista an actual mapped network drive (complete with letter) can be created and used much like a local directory or share. In addition to a simple installer as is required for most Windows Home Server add-ins, a Microsoft provided client-side update is required to enable secure access to the server. This add-in is nothing more than a bit of glue that wires up a few Windows sub-systems such as: Windows UNC Shares, an IIS Virtual Directory, WebDav and the Windows Distributed File System. Because this add-in uses existing functionality, all existing user accounts and share permissions are maintained and remain in full effect when a user accesses files via a Web Folder.